Has difficulty taking a shower independently for balance issues or standing for extended periods? Worry about falling or slipping in the shower? Want to take a relax shower? This Transfer Bench by HEALTH LINE MASSAGE PRODUCTS is designed to provide a safe, comfort and relax shower to individuals with balance issues or with limited mobility. Corrosion resistant aluminum construction, this transfer bench is equipped with extra-wide seat, removeable armrest and backrest. Besides, the outter leg is capped with extra-large rubber non-slip, anti-skid cup suction for additional safety and security. 10-level height adjustment extending legs (17.5"-22.5") with 0.5" increments, this transfer bench fits people of different height, and can be placed into most bathtubs. The bonus loofah back & body scruber helps you to clean your back, neck, shoulders and feet more efficiently and relaxly. 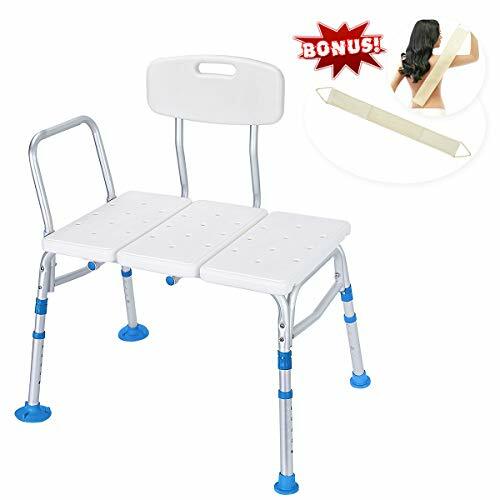 Tool free assembly, and supports up to 400 lbs, this shower/ bath/transfer bench chair is ideal for seniors, elderly, disabled, handicapped, pregnant women and those recovering from surgery or injury, and those need extra support while showering independently. SECURE, DURABLE & ENVIRONMENTAL FRIENDLY: FDA, CE certificated shower bench chair, made of heavy-duty anodized aluminum frame, recyclable, degradable HDPE and non-skid large suction cups, with weight capacity of 400lbs. QUICK AND EASY ASSEMBLY: the transfer bench comes partially assembled for a quick and easy installation, tool-free removal of legs, armrest and backrest, only takes 10 minutes to assemble. ONE LOOFAH BACK & BODY SCRUBER AS BONUS: two sided and dual function technology scruber, 4" x 31" with reinforced handles and bar soap pouch, perfect for cleaning the back, neck, shoulders and feet. Seat Dimensions: 16"(D) x 27"(W) x 17"-22"(H); Outside Legs: 21.5"(D) x 31"(W); Overall Dimensions:22.5"(D) x 31"(W) x 35" - 40"(H); Product weight: 10 lbs. 100% AUTHENTICITY GUARANTEE: 30 days free money back guarantee, 60-day unconditional return policy and 5-year limited warranty. Please rest assured to buy!